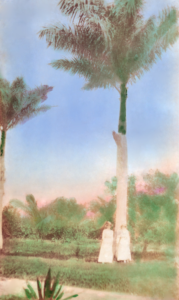 The images in this photography exhibit depict the lush tropical wilderness and romantic “cocoanut” groves that were once in the present day Ocean Ridge, Manalapan, Hypoluxo Island, Lantana, and Lake Worth. 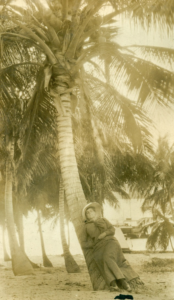 Photographs include the wide, deserted beach, the Intracoastal Waterway with launches, fishing vessels, and yachts, the bluffs overlooking the Atlantic Ocean, swaying cocoanut palms, children playing on the wharf, picnics at Lake Worth, the Boynton Hotel cottages, boat rides to Delray, people fishing, and a wooden cistern. Many of the images have accompanying hand-written descriptions. Pierson’s father, A. Romyn Pierson, II, purchased all of the land on the east side of the Florida East Coast Canal (today’s Intracoastal Waterway), north of the South Lake Worth (Boynton) Inlet to Lantana Road as a gift for his wife Leila.